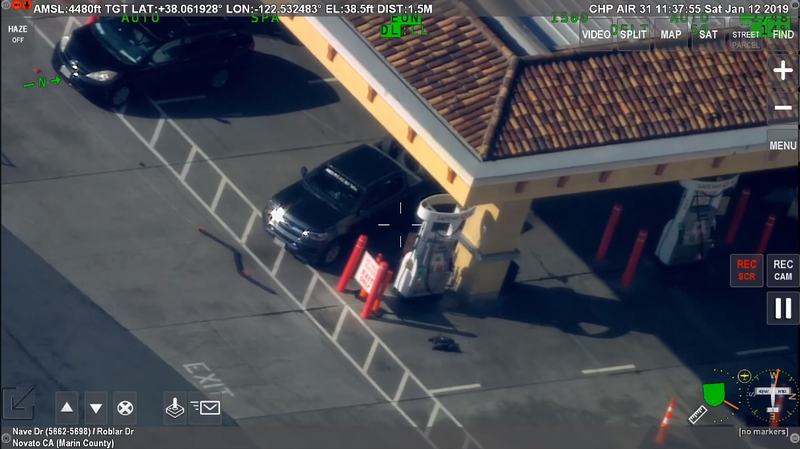 Police footage of a standoff resolved by a robot (seen below the pump closest to the pickup truck) that fulfilled the suspect’s demand for a cigarette by delivering a vape pen. According to the Bee, the suspect (identified by police as Juan Roman) appears to have been angry with some kind of problem at the pumps early on Saturday morning before he attempted and failed to ignite a gasoline-soaked floor mat at the convenience store. Police also said he was angry over family issues, the Bay City News wrote. Mahoney was close enough to the incident to hear officers yelling “Juan, put your hands up. Get out of your pickup. We don’t want to hurt you,” he added. According to KPIX, Roman was arrested without injury and “charged him with attempted arson and vandalism.” No firearms were found. Novato Police Department Lt. Sasha D’Amico told the station that officers were familiar with Roman, who she said had previous crises that resulted in police intervention (but none requiring the deployment of the department’s Crisis Response Team). Correction: A prior version of this article included an incorrect title of the agency which posted footage of the robot (very obviously the California Highway Patrol, not the “Colorado Highway Patrol”). We regret the error.